The governor said the death toll in North Carolina is now at 27. Duke Energy CEO Lynn Good reported at the briefing that power has been restored to 1.5 million people; 150,000 customers are still waiting. Trump asked Good how the Lake Norman area had fared, referring to the recreational area in Catawba County near Charlotte where there is a Trump National Golf Club. Across the state, authorities were keeping an eye on rivers that were expected to crest throughout the day Tuesday, in some cases exceeding the levels of Hurricane Matthew. Many communities and neighborhoods remained flooded, and curfews invoked by a number of local officials were still in effect Wednesday. The Neuse River was cresting in Goldsboro on Wednesday, pushing water onto nearby streets. A U.S. Geological Survey river gauge at Lillington showed the Cape Fear River was beginning to fall Wednesday morning. A gauge at Fayetteville on the Cape Fear showed the river leveling off there. Robeson County estimated the Lumber River, which crested Monday night at 25 feet, will crest again sometime over the weekend at 24 feet because of water coming in from other counties. There are more than 1,000 people in shelters in that county. The county reports 31 buildings have been destroyed and another 510 have received some type of storm damage. Rescues and damage assessment efforts are still ongoing, and the county plans to distribute water and food at several locations tonight. More roads into and out of Wilmington were opened after the port city was cut off from all land access in the wake of the hurricane’s landfall Saturday. From Cherry Point, the president traveled in a motorcade 20 miles up the coast to New Bern, where he helped distribute packages of hot dogs, peas and applesauce outside of Temple Baptist Church, according to the pool report. The president visited a neighborhood that was flooded from the Neuse River and asked residents how their houses fared in the storm. Trump asked one man about the large yacht that had washed up behind his house. “Is this your boat?” Trump asked. It wasn’t, the man said, according to the pool report. Trump headed next to South Carolina. At an afternoon news media briefing in Newport, Cooper and administration officials reassured residents that help was on the way, even as flood damage continues. “We’re not out of the woods yet,” the governor said. Cooper said 13 rivers were at major flood stage, and about 7,800 people are still in shelters. Fewer than 900 roads remain closed, down from 2,200, he said. But the Department of Transportation says it doesn’t know when Interstates 95 and 40 or other major highways to and from the coast will reopen, with rivers at or near record levels. Search and rescue teams are scouring the southeast part of the state and up the coast, state Emergency Management Director Mike Sprayberry said. Five mass kitchens have been set up, and another four will go into operation, Sprayberry said. All 911 centers in the state are up and running. Food has been in short supply in the 4,200-population Carteret County town of Beaufort, according to Mayor Rett Newton, who said grocery stores were just beginning to open. Newton said volunteers have been knocking on doors to make sure people had transportation to stores if they needed it, or to provide packaged meals from the N.C. National Guard. A delivery of 700 pounds of supplies donated by Duke University students arrived Wednesday afternoon as Newton spoke on the phone. 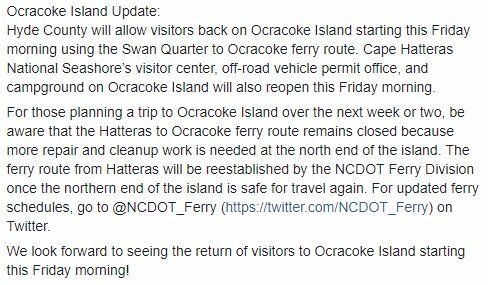 In Hyde County, the Cape Hatteras National Seashore tweeted that visitors would be allowed back on Ocracoke Island starting Friday morning using the Swan Quarter to Ocracoke ferry route. The visitor center and campground on the island will also reopen Friday. Amtrak is also starting to get back to normal. The Piedmont and Carolinian trains began operating again between Raleigh and Charlotte on Tuesday. The trains had not run since last Thursday, just before the storm reached North Carolina. Carolinian service between Raleigh and New York City is scheduled to resume Wednesday. Meanwhile, the Crescent, which serves Greensboro, High Point, Salisbury and Charlotte, is also scheduled to resume normal operations Wednesday. The other long-distance trains that pass through the state, including the Silver Star and Silver Meteor between New York and Miami, Fla., will resume Sunday. Elsewhere, farmers, utilities and environmentalists were assessing the extent of damage to the state’s hog lagoons, as well as sewage spills, livestock deaths and crop losses. The N.C. Department of Environmental Quality said Wednesday that five hog lagoons are damaged, up from four tallied Tuesday. The agency said that 21 lagoons are “overtopping,” or spilling over the edge, from heavy rainfall. At least three spills of untreated sewage have been reported in Johnston County. The N.C. Department of Agriculture and Consumer Services said Tuesday that so far 3.4 million chickens and turkeys have been killed by Florence, and 5,500 hogs have perished since the storm deluged the state. Staff writer John Murawski and the McClatchy D.C. bureau contributed.